You wouldn’t know it to look at me, but I am super cheap. I cut the mold off cheese and feed it to my kids (the cheese, not the mold). I squirrel away lightly used paper towels in a pile next to the kitchen sink so I can reuse them later to wipe the floors. My wedding gown was made with yards and yards of Shantung silk and hand-sewn with hundreds of seed pearls and cost $200. Resale shop. My tightwad habits may be slightly pathetic, but in this first-ever house-flip project I’ve undertaken, they’re proving to be an asset. I’m trying to find just the right touches to make this house dazzle — without losing my shirt on every single item. So, would-be flippers, here’s this month’s first piece of advice: Figure out where you can splurge and where you can save. I found Kenneth Ludwig sconces at a consignment shop in Oak Park and scored a crystal Pottery Barn light fixture at ReUse Depot in Maywood. With these nice finishes, I can buy the $2.29 Home Depot tile for the master bath and the room is still going to shine. It’s the home-decor equivalent of dressing up a cute shift from Target with the diamond pendant you found at an estate sale. Of course, all of this is completely premature. I’m not even close to the razzle-dazzle stage. In fact, the opposite. A couple of weeks ago, I spent five hours shoveling construction debris into heavy black contractor bags, dragging them down the hall and hurling them out a second-story window into the backyard below. Which leads me to another takeaway: Don’t toss your kids’ little red wagon.They may have outgrown it, but you’re going to need it. I used my kiddos’ old Radio Flyer to wheel trash bags out to the alley. We’re talking easily 600 pounds of detritus — chunks of drywall, attic insulation, lath and plaster, wire mesh, scraps of wood and metal conduit, sawdust, nails. Why is this happening? Why am I filling contractor bags with a quarter-ton of refuse on a Saturday night? It’s happening because I am the general. I am the very model of a modern flipper general. I do have a great contractor, he’s thorough and responsible, but he’s not overseeing the whole project. I am. It’s that cheap streak of mine. My contractor has finished Phase One, The Demo, and he’s waiting to return for Phase Two, The Drywall. In the interval, my mechanical guys — HVAC expert, electrician, plumber — are in the house and the work that the laborers were handling has fallen to me. Next tip: Don’t shy away from taking a hands-on approach. I borrowed a neighbor’s screw gun, guilted my 16-year-old son into joining me, and together the two of us lifted a 46-pound sheet of plywood over the window opening and screwed it to the frame. Then we took a selfie, which my son made me swear not to post on Facebook. That’s the irony of this house-flipping situation: I’m the general, but I’m not handy — cheap but not handy. I wouldn’t know a socket from a ratchet, a bolt from a screw. In that sense, I’m at a truly remarkable disadvantage. But I’m starting to believe that flipping a house is not so much about nuts and bolts as it is about relationships — relationships with lenders and real estate agents, electricians and laborers. That’s why it’s critical that you insist on strong partnerships. 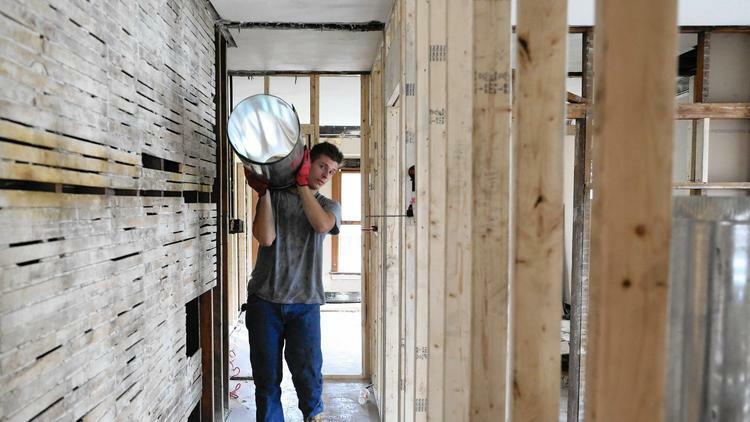 Renovating and ultimately flipping a home is a joint enterprise. When someone I’m doing business with talks down to me, whether it’s because I’m a woman, because I’m of a certain age or because it’s apparent I have no idea what I’m doing, that guy — or gal — is history. Listen to your inner Aretha Franklin: Require R-E-S-P-E-C-T.